Does this pickup work on an ej207 version 8 (factory twinscroll turbo setup) or would I need the pick up for the EJ20x? Im seeing conflicting answers on forums. A: We cannot confirm this pick up to fit the EJ207 as this pickup is only designed for the EJ25. A: Yes, this is the part number you need for the Factory Twin Scroll setup :) Essentially the factory twin scroll setup uses the same OEM sump as the USDM STi (EJ25). A: This Oil pickup will not work with the SOHC 2.5. The bolt holes will not line up. Does this come with a special o'ring or is it just a stock one? A: It comes with a new O-Ring. A: Yes, you'll want to use the OEM STI oil pan. will this fit 2005 subaru legacy gt 2.5 turbo? A: This will fit, 2004-2005 Forester XT and 2005 Legacy GT / OXT will need to verify their oil pan before ordering. In late 2005 Subaru changed the sump on those cars to match the Impreza lineup. A: This and the Killer B baffle will both work with your OEM oil pan. A: This will work perfectly with the OEM STi oil pan. What else do I need to buy to complete the install for a '13 WRX? I'm assuming a new o-ring, but what else? There are two questions here asking about an oil pan gasket... one answer says a new one is needed, the other says there is no gasket.... so uh, which is it? A: We would recommend using a new gasket any time you remove your oil pan. Maybe a dumb question but after you do this too a car with a protune will this cause any problems? A: This does not require a tune. A: This will not cause any problems with a car that has a protune. Will the killer b aluminum oil pan pick up and baffle work on a ej25 dohc n/a engine? If so.. Which set up is best? Do I need to install a new oil pan gasket whenever I unbolt the oil pan? 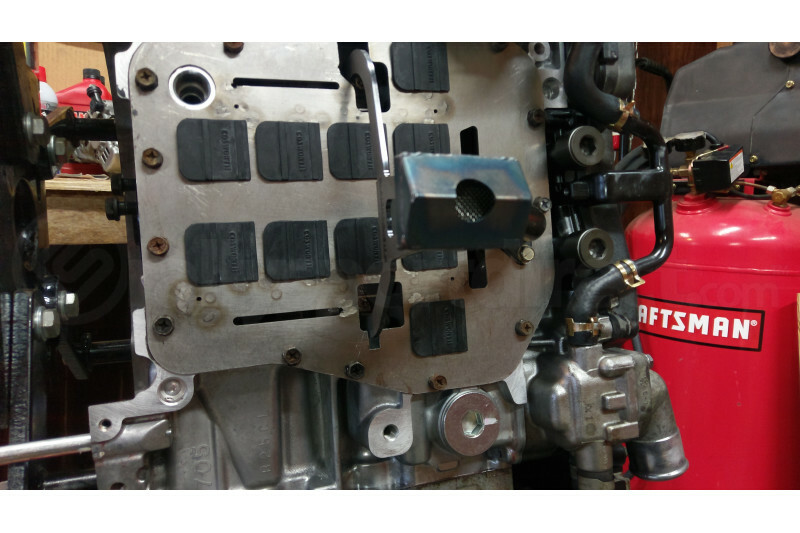 A: When removing the oil pan it is recommended to remove the old gasket, clean the surface to remove the old gasket, and then apply the new gasket. Does this work with a cosworth baffle? A: Unfortunately, we are not able to confirm cross fitment between the Cosworth baffle and the Killer B Ultimate Oil Pickup. A: Yes it will work with Cosworth baffle if you get a hack saw blade and notch the baffle a bit. I removed the oil baffle from car and removed all the rubber flaps so no metal filings could get stuck under the rubber. Then deburr the cut edges with a file before reassembling. Don't hate on my rusty bolts i ordered new ones. Just using them to hold baffle until permatex ultra black dries. Really dumb question, but will this fit the ej205 engine? A: No dumb question here. This will work but you will need to have a Turbo EJ25 oil pan installed to use this pickup. Do you know if the oem oil pickup is still an issue on the 15+ sti's, from what I've read it doesn't seem to be. Do u have any insight master wizard? A: Yes, it's the same part number from 2006+. No redesign was done for the 2015+ STi. Do you have to drain the oil to install this? A: Yes, you will need to drain the oil as the oil pan must be removed to install the oil pickup. Will i need an 05 sti windage tray as well as the ej25 pan? Or can i just get the pan and run the Oem windage tray?? A: This works fine as an OEM replacement pickup, but the aftermarket windage tray and pan are beneficial on top of this item. So, which model pickup would I need for a 2004 subaru forester xt? This one? A: Unfortunately we do not have any oil pickups that are confirmed to fit your car due to the unique sump design on 04-05 XTs. We do offer an oil pan kit from Killer B that includes their Ultimate Oil Pickup. 2004-2005 Forester XT and 2005 Legacy GT / OXT will need to verify their oil pan before ordering. In late 2005 Subaru changed the sump on those cars to match the Impreza lineup. A: It will fit most 2.5 liter oil pans although we cant guarantee fitment outside of the U.S.
Can I still use the OEM oil pan if I replaced this with the Killer B baffle plate? Why/Why not? A: If you have the 2.5 oil pan you won't have to change it, but if you are using a 2.0 pan you will want to upgrade to the 2.5 pan as it will not fit. Does the killer b oil pickup system require purchase of that oil filler relocater as well? A: This does not require the oil filler relocation. A: Replacing the pickup does not require the oil fill relocation tube. Since you're increasing the pickup 3x can the oil pump keep up with it easily? or does it have any problems keeping up with it now since the slow is such drastically increased? A: This pickup will not have any negative effects on the stock oil pump. If i use the Killer B oil pick up with killer b's aluminum oil pan on my 04 wrx wagon will it work? Or does it only work with the sti oilpan? A: This part mounts to the bottom of the engine and transfers oil from the pan to the oil pump. The stock pickup is known to crack and this oil pickup will not. A: The OEM oil pickups are prone to failure the Killer B Motorsport product is a more robust design. It also has a free flowing, less restrictive, smooth bend vs the OEM pinch bend. What about the oil pan needs to be verified for the 2004-2005 Forester XT? How long (approx.) does it take to install this part? Is it just a case of drop the sump off and swap over, or is it a bit more involved? Any hardware come with this purchase or is it just the 1 item? No install instructions came with the one I ordered. A: Hardware is not included, but you can reuse the stock hardware. Instructions are also not included, but they are not necessary because this will be a direct replacement for the stock pickup on most applications. So this will fit a 2011 wrx with no issues? Will the pickup fit inside my stock oil pan? I have an 02 wrx. Do I need a new oil pan gasket after removing the pan? Do you guys have them? I have 2009 sti. can this just bolt in no other changes? Or do I need a new oil pump? A: This is a direct OEM replacement and will not require a new oil pump.